Create a safe work environment and a controlled print room temperature without loosing the open design. Additionally the cover unit protects the print object from outside influences. The material of the cover unit is plexiglass, so it's still possible to watch your design being printed. 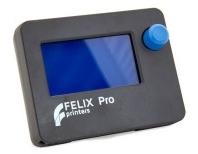 Upgrade your FELIX Pro 1 and/or FELIX Pro 2 with the Cover Unit! 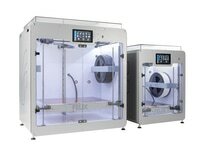 The FELIX Tec Series Maintenance and Repair set contains several tools to get your Tec 3D printer quickly up and running again. The set contains essential spare parts which can be replaced very easily. We have selected the spare parts based on user's experience and on our knowledge of what might wear and tear due to usage. Together with the tools to perform maintenance, this is a great kit to always keep your printer going. Add the new FELIX Pro Touchscreen to your FELIX Pro and have the full PRO experience. Thanks to the intuitive interface the screen is incredibly easy to operate. With it's built in (WiFi) webbased control you can control your 3D printer from any browser. The FELIX 3 Maintenance and Repair set contains several tools to get your FELIX 3 quickly up and running again. The set contains essential spare parts which can be replaced very easily. We have selected the spare parts based on user's experience and on our knowledge of what might wear and tear due to usage. Together with the tools to perform maintenance, this is a great kit to always keep your printer going. All you need for sure adhesion of 3D prints Magigoo is an easy to use 3D printing adhesive designed to address 'the first layer not sticking problem'. Magigoo ensures a strong adhesion to the hot plate. But the magic starts when printing is ready: just wait for the plate to cool down and then remove your prints with just a finger flick! In addition, Magigoo helps to prevent warping. Isn't it magic? Regardless of you being a hobbyist or professional - it is extremely rewarding to have a 30 hour print complete without any warping and having it release easily once cooled. Easy application: applying Magigoo is as easy as child&#39;s play. Shake, press, apply. Spread on an active printing area only. No need to cover the whole surface. Easy-release: Magigoo adhesive properties are designed to release the 3D print once the build plate has cooled. Easy-clean: Magigoo is easily cleaned with water. Long-lasting: Magigoo last for 100+ average prints. Odorless and safe: Magigoo is safe to use - be it in a closed room or educational workshop with kids. Please do not press the bottle as "ketchup bottle" otherwise the applicator may pop off. Bottle may be slightly squeezed, only when the nib is pressed against the bed and it may be necessary only if bigger flow is required. Bottle must not be squeezed when cap is off any other time as it may result in glue popping out of the bottle. Get an extra bed to be able to start your second print directly after your first print finished. Just remove the bed from the printer and place a clean one.